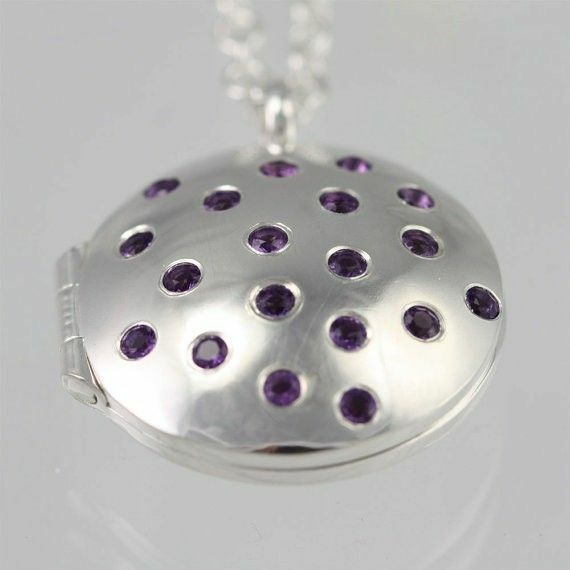 A very unique and contemporary locket made from sterling silver and natural Amethyst. 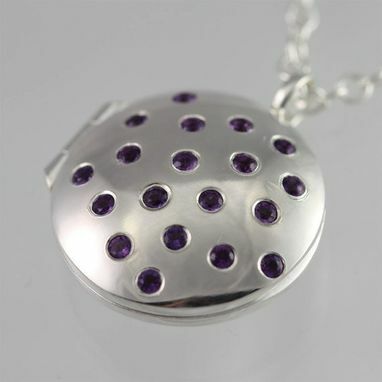 Hand crafted sterling silver locket with natural Amethyst stones. Very contemporary, classy, and unique. Comes on a 24 inch sterling silver chain with the artist's tag attached at the clasp. 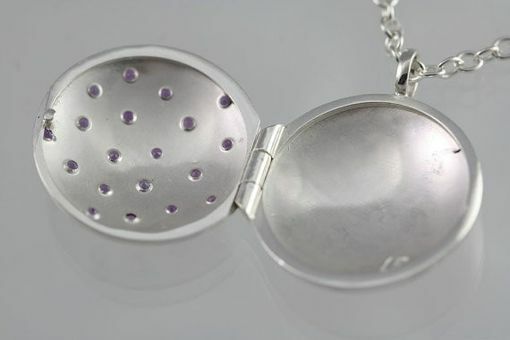 Fabricated by hand using sterling silver sheet that is punched into discs, domed, soldered, and polished to form each side of the locket. A hinge is hancrafted and soldered to the locket along with a bail and latch mechanism. The fine silver is raised to the surface to remove firescale and prevent tarnishing. Nineteen 2mm Amethyst stones are flush set on the surface of the locket. The piece is brought to a glossy finish. Perfect for storing a tiny photo or keepsake. The locket is 7/8 inch in diameter. Available made to order with any color of stone. Feel free to ask me any questions! Can be made with any birthstone. Just ask me for a price quote. Please allow 7-10 days for fabrication on custom orders. The inside rim measures 5/8 an inch in diameter. A custom photo insert can be made upon request, just email me the photo you would like to use.